Unfortunately interest in the UKOUG’s Systems Event has dwindled a bit recently which lead me to focus on the Exadata in Germany this year. I am going to speak – in German – about how you can make your migrations to Exadata easier. This is a talk I have delivered a few times before but leaped at the opportunity to update the material to release 12.2. I am very glad to see my colleague @fritshoogland and many other great speakers too numerous to mention at the event. If you are an engineer working on Oracle Exadata and its cousins this is definitely the event to attend. This entry was posted in Exadata, Public Appearances, Uncategorized and tagged Exaday on April 24, 2017 by Martin Bach. The first conference I’ll be attending is in Dublin, for OUG Ireland 2014 on March 11.I’m going to help out with RAC Attack and also present about Technologies for Developing Highly Available Applications in RAC 12c at 14:50 for about 45 minutes. What can you expect? Here is the official abstract, I am looking forward to the presentation and the live demos. I have updated the material to include the latest Oracle 12c cell software features as well as support for the new RDBMS architecture-Container Databases-and will update delegates on how this works and also how Exadata supports Oracle’s consolidation platform. There are many cool new features in 12c worth exploring and knowing about. For me the meeting starts on Wednesday 2nd when I’m flying to Oslo. This is without a shadow of a doubt a very good conference, and I can only recommend it-exactly like the others on this page. It is very well organised and definitely worth going. There are very few other conferences where you can mingle with the presenters and chat about all sorts of things in the same way as there. I have attended twice already and enjoyed it every time. Enkitec’s Extreme Exadata Expo is one of the conferences with the highest technical content I can imagine. I attended last year and was really impressed by the speakers and the content. The impact on “Big Data” is clearly visible in the agenda and like last year you can find Exadata and “Big Data” talks. I am quite chuffed I made it on the agenda of the event! I’m going to present “Think Exa” together with my colleague Frits Hoogland. In this presentation we are going to talk about setting your mindset on Exadata to overcome pre-ASM and pre-RAC habits. Unlearning some things we have been taught (or doing) for many years take its time, and we are hoping to give the audience an overview of what can be achieved with the platform. At the same time that I am happy that I secured a speaker’s slot I am even more excited to attend the conference. Looking at the list of speakers who already confirmed their attendance it is going to be a blast. I am looking forward to seeing my colleagues from the United States but also to catch up with new and old friends. Looking forward to seeing you at one of these events! This entry was posted in Public Appearances on February 11, 2014 by Martin Bach. If you haven’t thought about attending UKOUG’s AIM & Database Server combined SIG, you definitely should! The agenda is seriously good with many well known speakers and lots of networking opportunity. It’s also one of the few events outside an Oracle office. A little known MOS note describes how you can potentially reduce downtime by a significant amount when migrating databases between systems with different endianness. Many sites are looking for ways to move their databases from big-endian platforms such as HP-UX, AIX or Solaris/SPARC to an Exadata system running Linux. A new functionality called cross-platform incremental backup in conjunction with the already-known cross-platform transportable tablespaces makes this possible. When using incrementally rolled forward backups the source system stays up while the destination database is instantiated. Further incremental backups are then applied to the destination to keep it current-while the source system stays fully available. At the time of the cut-over only a final incremental backup needs to be transferred to the destination host, which is significantly smaller than the full set normally transferred. The time window for when the source tablespaces have to be offline often is a lot smaller than compared to the traditional TTS process. This entry was posted in 11g Release 2, Exadata, Public Appearances on July 15, 2013 by Martin Bach. Just a short notice to those interested that I’m very proud to be in the lineup for Enkitec’s Extreme Exadata Expo. The event takes place August 5-6, 2013 and is held in the Four Seasons Resort & Spa, Irving, Texas. There is plenty of time for you to register. I was really sorry I missed out last year but this time I’m glad to participate and attend! The list of great speakers includes too many to name here-you should see for yourself about who is coming to Dallas this August and why this event is unmissable. I’m hoping to see you there! This entry was posted in Exadata, Public Appearances and tagged Dallas, E4, Enkitec on May 22, 2013 by Martin Bach. So this is a little bit of a plug for myself and Enkitec but I’m running my Grid Infrastructure And Database High Availability Deep Dive Seminars again for Oracle University. This time these events are online, so no need to come to a classroom at all. Providing a highly available database architecture fit for today’s fast changing requirements can be a complex task. Many technologies are available to provide resilience, each with its own advantages and possible disadvantages. This seminar begins with an overview of available HA technologies (hard and soft partitioning of servers, cold failover clusters, RAC and RAC One Node) and complementary tools and techniques to provide recovery from site failure (Data Guard or storage replication). In the second part of the seminar, we look at Grid Infrastructure in great detail. Oracle Grid Infrastructure is the latest incarnation of the Clusterware HA framework which successfully powers every single 10g and 11g RAC installation. Despite its widespread implementation, many of its features are still not well understood by its users. We focus on Grid Infrastructure, what it is, what it does and how it can be put to best use, including the creation of an active/passive cold failover cluster for web and database resources. I hope to hear from you during the course! This entry was posted in 11g Release 2, Linux, Public Appearances on April 24, 2013 by Martin Bach. 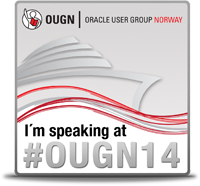 The annual conference held by the Oracle User Group in Norway has once again been just great. It was the second year I went and I have to admit that it was every bit as good as last year, and that’s holding a very high standard. The combination of such great hosts, great speakers and a wonderful atmosphere make this one of the best conferences to attend in Europe. The added benefit of being on a boat makes it a great opportunity to meet the speakers and to hang out with during dinner and after the sessions. Unfortunately I had to leave a day early and write these lines while on a train back home. This entry was posted in Public Appearances on April 21, 2013 by Martin Bach. I had the great pleasure to spend the better part of last week at the Norwegian Oracle User Group’s spring conference. Martin Nash and I helped promote the Real Application Cluster platform on the attendees’ laptop in a program called RAC Attack. RAC Attack has its home on the wikibooks website http://racattack.org where the whole program is documented and available for self-study. The purpose of the hands-on labs which Jeremy Schneider started a few years ago is to allow users to get practical experience installing Oracle Linux, Grid Infrastructure and the RDBMS binaries before creating a two node database. Following the database creation a practical session ensues which explains certain HA concepts with RAC such as session failover. We are planning on greatly enhancing the lab session as we go along. If you have any suggestions about what you would like to see covered by us then please let us know! This entry was posted in Public Appearances and tagged Linux, Oracle, rac attack, virtualbox, vmware on March 26, 2012 by Martin Bach.